The extra large black heated TOUGHSHELL jacket kit is powered by the M12 REDLITHIUM battery. The heated jacket's carbon fiber heating elements create and distribute heat to the chest, back and front hand pockets. A single touch LED controller heats up the battery heated jacket to three heat settings. The MILWAUKEE heated jacket kit's Quick-Heat funtion heats up three times faster than previous jackets and market competitors. The TOUGHSHELL stretch polyester jacket mateiral delivers five times longer jacket life than previous MILWAUKEE softshell heated jackets. The durable material also provides wind and water resistance to survive the elements whether on the worksite or enjoying the outdoors. This kit comes with one heated jacket, an M12 battery and compact charger and power source. Peel Coat is a peelable rubber coating that enables endless customization for vehicles. This premium formula is easy to peel, safe to wash and can be applied to metal, plastic, chrome, glass and more. 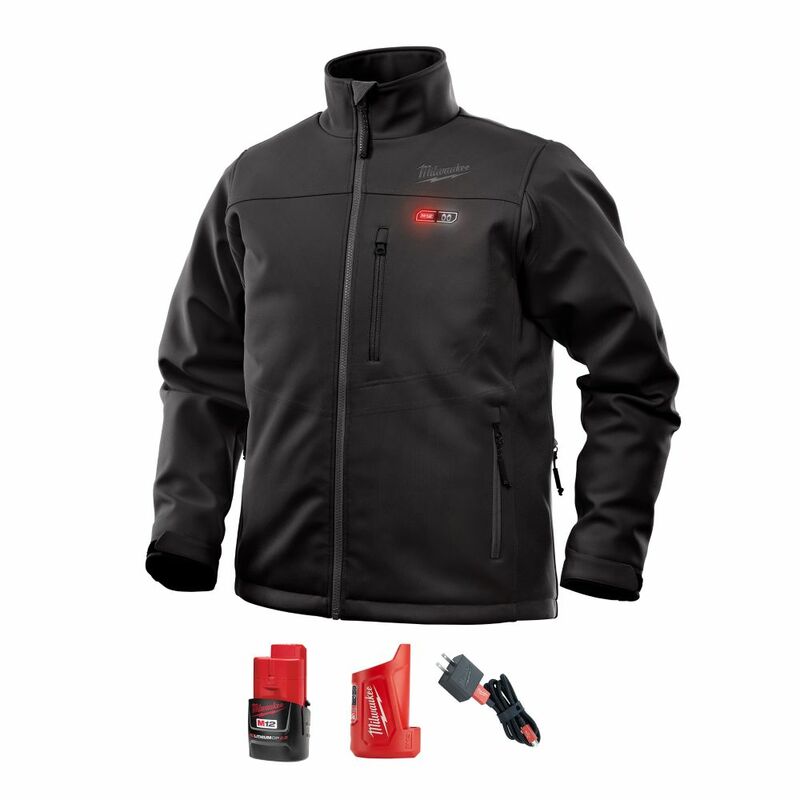 Men's X-Large M12 12-Volt Lithium-Ion Cordless Black Heated Jacket Kit w/ (1) 2.0Ah Battery, Charger The extra large black heated TOUGHSHELL jacket kit is powered by the M12 REDLITHIUM battery. The heated jacket's carbon fiber heating elements create and distribute heat to the chest, back and front hand pockets. A single touch LED controller heats up the battery heated jacket to three heat settings. The MILWAUKEE heated jacket kit's Quick-Heat funtion heats up three times faster than previous jackets and market competitors. The TOUGHSHELL stretch polyester jacket mateiral delivers five times longer jacket life than previous MILWAUKEE softshell heated jackets. The durable material also provides wind and water resistance to survive the elements whether on the worksite or enjoying the outdoors. This kit comes with one heated jacket, an M12 battery and compact charger and power source. Men's X-Large M12 12-Volt Lithium-Ion Cordless Black Heated Jacket Kit w/ (1) 2.0Ah Battery, Charger is rated 4.1 out of 5 by 106. Rated 2 out of 5 by Nathan from The battery pack that came with the coat kept breaking.... The battery pack that came with the coat kept breaking. It wouldn’t charge a battery and would make a weird noise every time you put a battery in the portable charger to charge it. Then when I exchanged it the three times. I finally got it to work with the coat it only lasted about 15 mins. Rated 5 out of 5 by Alfonso from sweet jacket. keeps me warm and blocks out the... sweet jacket. keeps me warm and blocks out the wind and rain really well. the only thing, it doesnt have a hoodie. it would have been better with a hoodie.